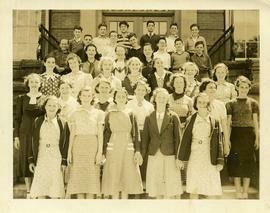 Photograph depicts the grade 8 class at Cecil Rhodes School in Vancouver, BC in 1936. Robert (Bob) Coleman is in the photograph. Written on verso: Jack Gr [and] 45K. Stamped on verso: B.C. Photo Service. 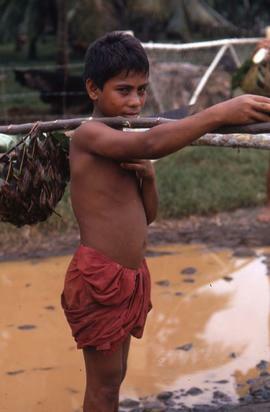 Colour Kodachrome 35mm slide depicts a boy holding a balanacing stick on his shoulder to carry a thatched basket. Photograph depicts Leya Robinson at Burquest family picnic in Rocky Point Park. Photograph depicts children on the dock and in the water at Camp Hatikvah. Photograph depicts a group portrait of the United Synagogue Youth. Photograph depicts three children looking at the Canada display.